Cellist Inbal Segev’s debut release for AVIE features the lush and romantic sonatas by Chopin and Grieg, and the Fantasiestücke by Robert Schumann. 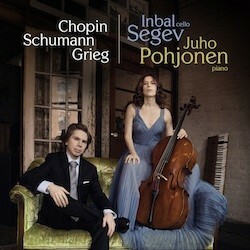 She is joined by Finnish pianist Juho Pohjonen, a fitting partner for the pianistic Chopin and the virtuosic Grieg. In Schumann’s own transcription of his “Fantasy Pieces,” originally for clarinet, the lyrical quality shines through on Inbal’s 1673 Ruggieri cello. Inbal Segev reaches thousands of people across continents through her influential YouTube video masterclass series Musings with Inbal, teaching core repertoire, cello technique and new works. Her many honours include top prizes at the Pablo Casals, Paulo and Washington International Competitions. She began playing cello in Israel at five and at 16 was invited by Isaac Stern to continue her studies in the US. She holds degrees from The Juilliard School and Yale University.